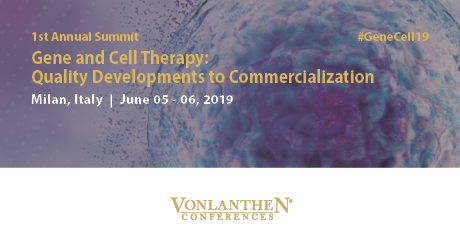 We are pleased to invite you to the Annual Gene and Cell Therapy: Quality Developments to Commercialization Summit, scheduled for June 5-6, 2019, in Berlin, Germany. This premier B2B event provides the appropriate platform to engage and discuss ideas with your fellow peers, while facilitating a professional atmosphere and environment for good company representation and development. The Summit will shed light on the delivery of cost and quality efficient process development, manufacturing and commercialisation of cell and gene therapies. It is an honour and privilege to invite you to participate in this Summit. We look forward to welcoming you in Berlin in June!